There are more than 25 different types of mint, many of which cross-pollinate readily to produce variable hybrids. Peppermint, which originates in Europe, was the result of one such cross, possibly in ancient times, and is now naturalised worldwide. It is widely cultivated for its oil, which is used in flavourings and to scent perfumes and toiletries. The herb is used by itself as a cooling, stimulating and digestive beverage - soothing the stomach. Mint can be combined with other herbs to improve their taste. The strong tea or tincture is the best cure for hiccups. 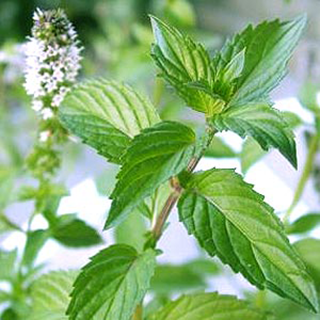 The breath-freshening effects of mint make it the herb of choice for smokers. Add 2–3 fresh leaves to 1 cup of boiling water and infuse for 5 minutes for everyday drinking; especially suitable after meals. Add a few fresh sprigs to a basin of boiling water and use as an inhalant to ease nasal congestion. Use 1/2oz (15g) to 2 cups of boiling water and take 1/2–1 cup 2–3 times daily for nausea, indigestion, flatulence, or colic, or with other herbs for colds or catarrh. Add 30 drops of essential oil to 1/2 cup vegetable oil and massage into aching muscles and joints, or use for scabies or ringworm. Use in a spray bottle as a mosquito repellent or foot deodorant. The dosage of a 1:3 tincture is 2–4ml a day, or max. 30ml per week. Prefers fertile, moist soil in full sun or partial shade. Can be invasive if growing conditions are ideal. Propagated by division in spring or autumn or by tip cuttings in spring or summer; easy to root if the sprigs are kept standing in water for a few days. As a hybrid, it is sterile and produces no seeds. In general, mints should not be grown from seed, as they cross-pollinate readily and may not come true.